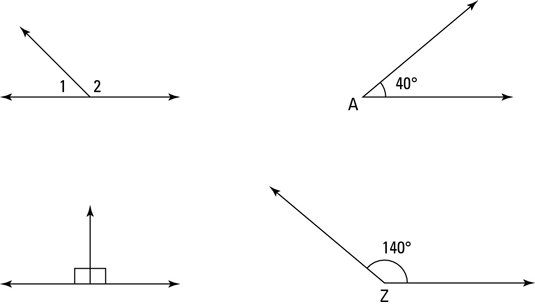 Adjacent angles: Adjacent angles are neighboring angles that have the same vertex and that share a side; also, neither angle can be inside the other. This very simple idea is kind of a pain to define, so just check out the figure below — a picture’s worth a thousand words. None of the unnamed angles to the right are adjacent because they either don’t share a vertex or don’t share a side. 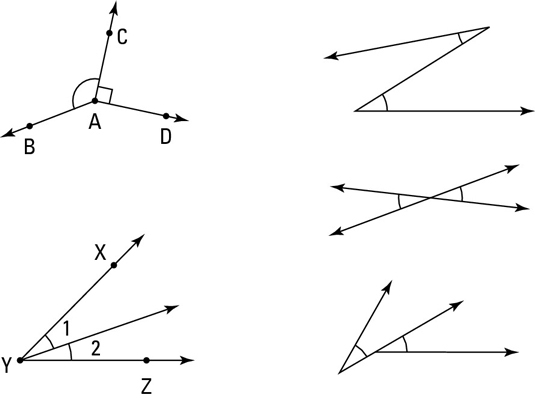 Warning: If you have adjacent angles, you can’t name any of the angles with a single letter. Instead, you have to refer to the angle in question with a number or with three letters. Complementary angles: Two angles that add up to 90° (or a right angle) are complementary. They can be adjacent angles but don’t have to be. Supplementary angles: Two angles that add up to 180° (or a straight angle) are supplementary. They may or may not be adjacent angles. 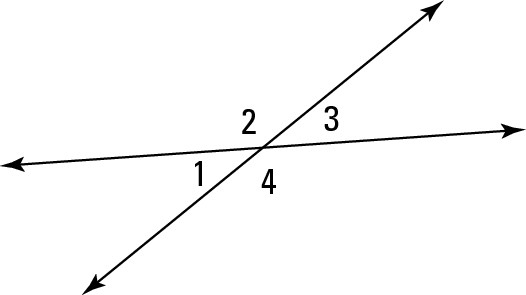 Such angle pairs are called a linear pair. Angles A and Z are supplementary because they add up to 180°. Vertical angles: When intersecting lines form an X, the angles on the opposite sides of the X are called vertical angles. Two vertical angles are always the same size as each other. By the way, as you can see in the figure, the vertical in vertical angles has nothing to do with the up-and-down meaning of vertical.